PinkTaxiBlogger: Do you Ride a Camel to School? We all agree that Dubai is a case study for rocambolesque development, never seen before! It all happened in the last 6 years at a dizzying speed, but for me, Dubai's development was in the making ever since I arrived here in 1971, at an age when I was too young to answer the quintessential question: "you live in Dubai, do you ride a camel to school?" We used to encounter camels much more frequently in the seventies and the eighties, than we did in the nineties and today. I always answered with a smile: "well we drive to school, but yes we do see camels wandering on our way there". In fact, we would frequently stop our car and approach the strange looking animal. On such an occasion my father took his youngest out of the car, at an age when kids are still impressed by camel sighting and he reassured him with a "say hello to the camel!" At which my brother retorted: "your Arabic is better than mine, why don't you?" This anecdote frequently comes to mind, furitively, without elaboration: just the simple comedy of it, to make me smile in a yoga pose called Camel. 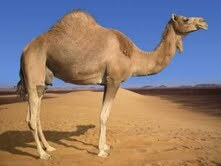 Camel was a yoga pose that I refused to do when my fellow yogis performed the back bend that looks like a circus stunt. I consider it as an achievement today because I have overcome my fears and its accompanying nausea. I have always had a debilitating phobia of back bends. At camp, I have practiced back dives for hours, clinging on to diving instructors but not ever able to leap backside down. In yoga, once I got it, once my eyes remained steady on one spot and I closed my mouth, I accomplished a feat, that reminds me of that passive, relaxed animal that has always been roaming in my childhood. The camel. "Allow your heart to blossom", requests the instructor. Then my mind catches a glimpse of "L'Ecume des Jours", the novel mentioned on this blog this month. It is no wonder that it took me so long to grasp that notion or other yoga positions. People haven't asked the "do you ride a camel to school?" to my kids anymore. Instead they marvel at the fact that they ski indoors and live in a high rise, in Dubai. I end up corecting facts and separate them from fiction.The Camel incident with my youngest was near the Karate Club on the then-narrow Al Wasl Rd(known then as the Iranian Hospital Rd);when we saw a camel munching on a tree.Those days,camels were let free and so many fatal car accidents took place especially on the Fujeirah,Abu Dhabi and Ras AlKhaima roads.When I asked the 5-yr old boy why dont you say somthing to the camel,the blond white kid answered: you are Arab,you know his language.